French bank Natixis has announced a 1.2bn-euro ($1.75bn; £898m) write-down of exposure to bad US mortgage debt. Shares in the bank, which is the latest to indicate its losses stemming from exposure to the US sub-prime mortgage market, fell 14% on the news. European banks have now revealed sub-prime losses of more than $36bn, with Swiss lender UBS the worst hit. 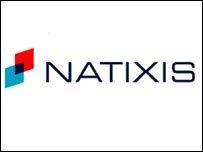 Natixis, France's fourth largest bank, said its 2007 profits would now total 1.2bn euros - half its previous target. Analysts at Goldman Sachs welcomed Natixis' disclosure as a step forward for the company. Sub-prime mortgages are home loans given to people with poor credit ratings, or those on low incomes. The industry is in crisis in the US following record loan defaults and home repossessions last year in the face of higher mortgage payments. The losses spread from US banks to lenders around the world, as some of the sub-prime debt was resold as part of wider debt offerings.